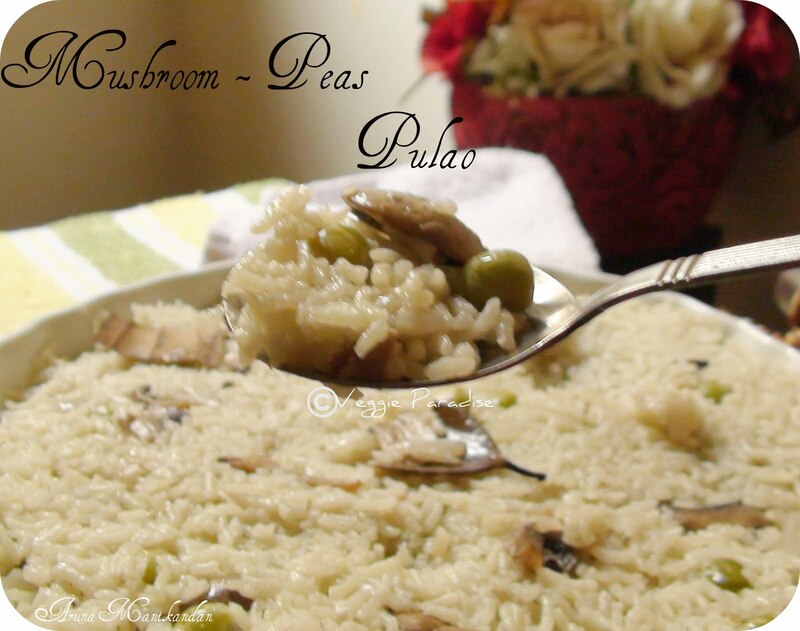 A Simple and delicious pulao for Mushroom lovers.I always love to prepare one pot dishes as it is quick and easy with very less chopping,less ingredients and no grinding. I have not used any powders for this pulao, so if needed add according to your taste and enjoy. 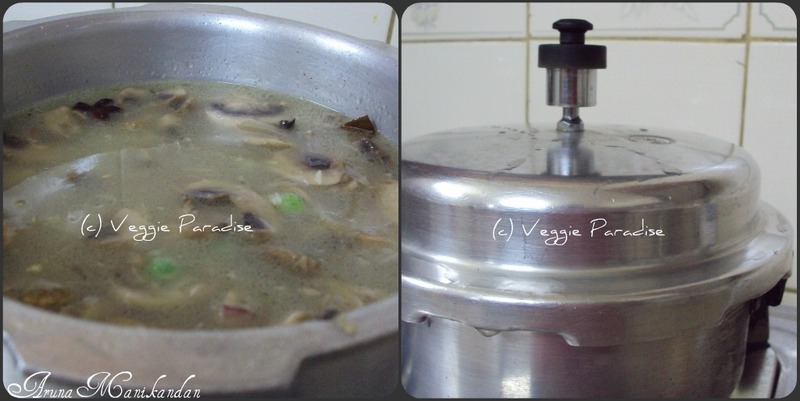 Wash and slice the button mushrooms, chop the onion and split the green chilly lengthwise. 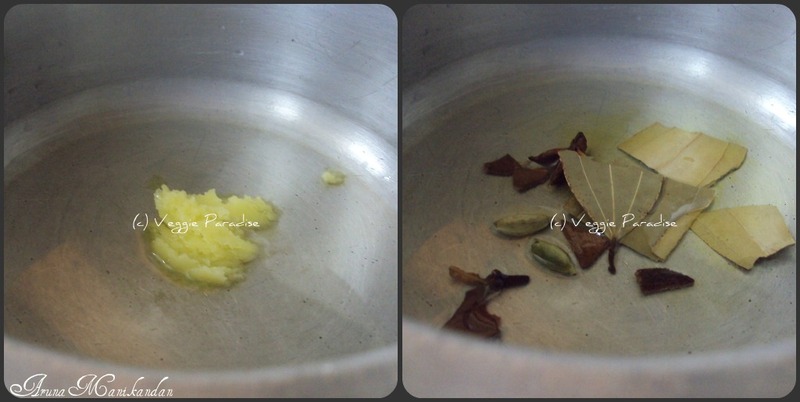 Heat oil and ghee in the pressure cooker. Add bay leaf, cardamom, star anise, cinnamon and cloves. Saute for a min. Add the green chilly ,saute it. Now add the chopped onions and fry until it turns translucent. Add the ginger-garlic paste, saute it until the raw smell extracts from it . Add the mushrooms and peas and saute it for 5 mins. Meanwhile wash the rice. Drain the water and keep it aside. 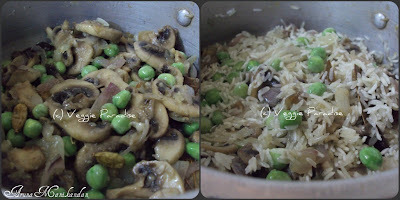 After 5 mins, add rice with these mushroom and peas , saute it for a min. Now add two cups of water along with salt and allow it for 2 whistles. 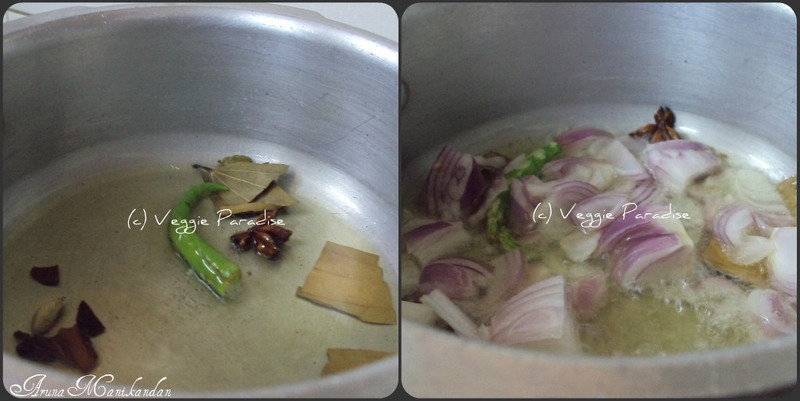 Always crush and add bay leaf, that enhances the taste of ur dishes. For more flavor you can add fresh coriander leaves and mint leaves at the time of sauteing the green chilly. Finally if you want garnish it with cashews roasted in ghee. Delicious pulav and nice combination of spices. Love the picture too, nice presentation. Yummy looking pulao dear. Mushrooms have made it look so inviting.Great preparation. have always used paneer and peas combo..mushroom sounds wonderful..yumm..will try it next time..
Looks delicious & so inviting. very nice it would be a great treat for sunday lunch! 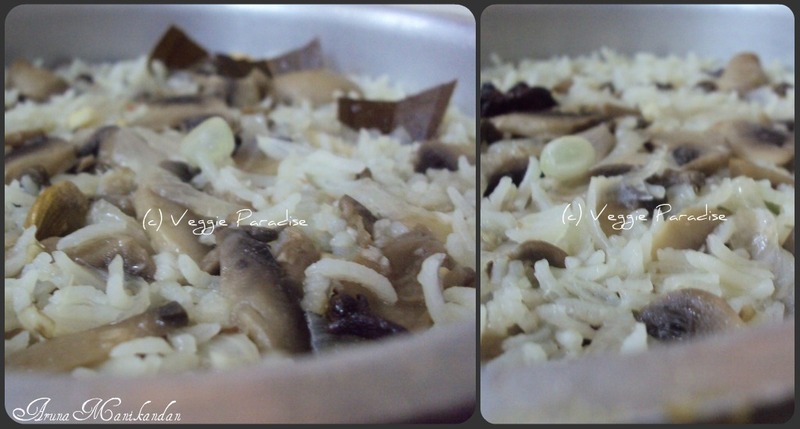 Healthy and delicious pulao. the step by step clicks make it so easy to follow.. Thanks for your visit and follow! 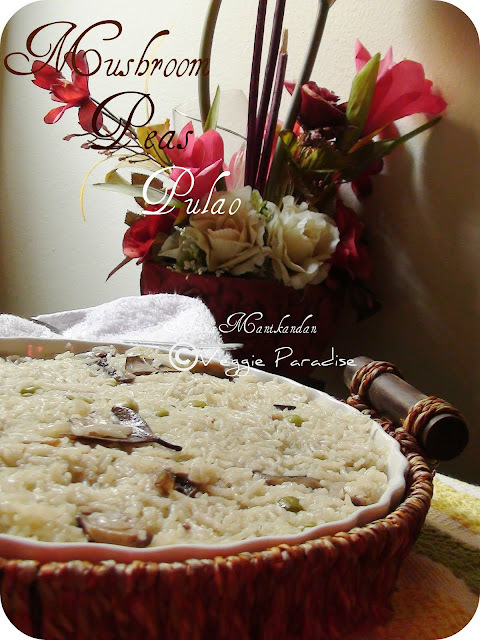 Omg, thats very inviting and droolworthy pulao..makes me hungry..
good photography (liked the watermark). 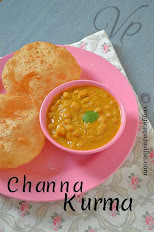 Liked your memberships in various foodie groups. Do you have a twitter account too ? Love pulao in any form and this looks great and inviting. lovely looking pulao...good combo ,superb presentation ! very inviting pulao..looks so YUM !! 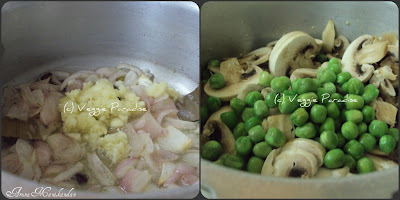 My son's favorite mushrooms and peas .. nice step by step presentation. Looking at you post gives a satisfaction of eating a briyani ;) Nice recipe! Nice detailed post! the pulao looks well prepared and super tasty!! Nice combo. Pulao looks fabulous, delicious and tempting. Looks so delicious I love pulao! Delicious pulao..lovely combo of veggies. I loved the way you presented and explained the recipe...such an elaborate and clear journey to the final destination! Nice pulao.Haven't tried this combination. Super delicious pulao.. so aromatic ..
Yummy pulav. Highly appreciate your step by step procedure. Great. 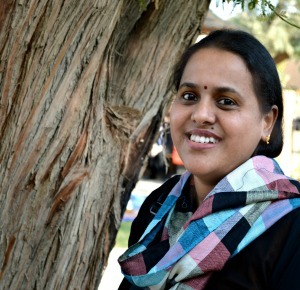 thanks for visiting my blog Aruna. love your pictures. maybe you could teach me how to place side by side pictures on a blog! 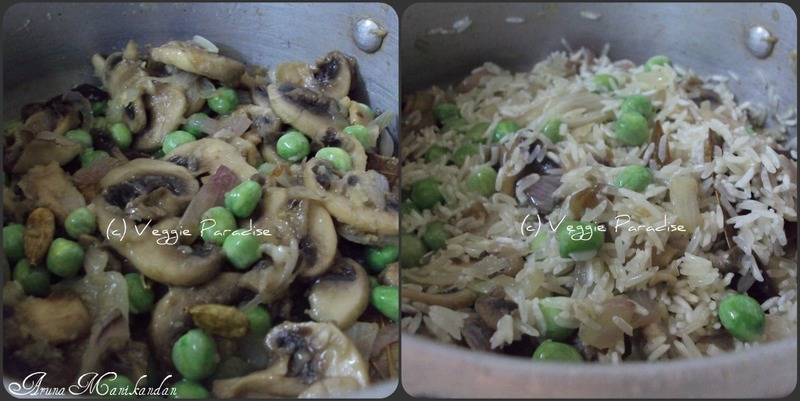 Nice combination of mushrooms and peas in a pulao. looks very delicious. Collect ur award from my blog dear! Mushroom pulav Looks delicious..I ll try this soon..
What a lovely one pot meal:-) Delicious i must say!! I am with you on One pot meal.. It is easy to whip up something quick during weekdays.. Pulav looks yum.. This smells so flavorful.. love the clicks..